Water, it is the lifeline to a green, luscious garden. 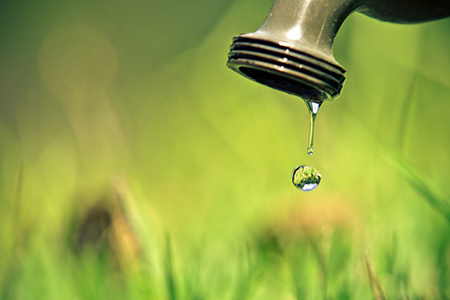 The spring and summer months tend to be when homeowners see a significant increase in their water usage, and by extent utility bills, in order to help keep their garden flourishing. A great looking garden does not have to break the bank, in fact, a gardener could rely on mother nature from time to time with a few practical strategies administered should help to conserve water while keeping the garden in peak shape. Water Early: The easiest way to ensure the water that is used goes further is to administer water around sunrise, when the winds and temperatures are both low. Calm winds and low temperatures reduce water loss and ensure water is reaching the plants. Maximize Rainwater: Rainwater can be used in a variety of ways; for instance integrating rainwater collectors like a rain barrel, into the home's gutter system. It is estimated that 1,000 square foot roof can she up to 600 gallons of rainwater per hour in moderate rainfall. Tune Up Sprinklers: If the garden or yard has an in-ground sprinkler system, it should be inspected to ensure that it is operating efficiently. Adjust the sprinkler heads so water is not wasted on pavement or patios. Contemplating adding a rainfall sensor into the sprinkler system to avoid unnecessary watering. Tune Up the Hose: Watering by hose manually with a standard hose and nozzle is inefficient. The amount of water lost to evaporation, runoff and mist could be saved by using a wand nozzle or soaker hose. Check the nozzles of hoses and spouts to make sure there is no dripping water otherwise water is being wasted and more than is realized to be. Incorporate Water-Friendly Details: Plant and Garden design can be tailored to maximize water usage. Start by using native plants that are already adapted to the soil conditions at your home, and consider placing mulch around the plants to reduce water runoff, minimize weed growth and help keep the soil moist. Also, consider placing plants that require more water next to each other so they are better targeted all at once with a drip irrigation system or by adjusting sprinkler zones. A beautiful garden is within reach without having to pay higher utility costs.